So, lets start from the beginning. Goat Showing 101. The basic premise is that one shows a goat the way one shows a dog. 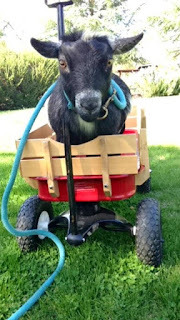 Goats wear collars and leashes, and humans walk them around in a ring. The classes are sorted by gender and age; the ages are divided into junior and senior. The judge compares each goat to the breed standard and then ranks the goats in order of best to not-so-best. The winners of each class then compete for “Junior Champion” and “Senior Champion” and then the Junior Champion and Senior Champion compete for GRAND Champion. Whoo hoo! And for all of this you get… a big purple ribbon! Don’t forget the glory. Yes, it is all about the glory. But, wait, I forgot the best part: showmanship. The first classes of each show, usually starting at 8 or 9 in the morning, are showmanship, where the humans compete against each other based on their knowledge of goats and the intricacies of showing a goat to its highest potential. It’s very cute when little children, like 3 years old, walk in with a goat larger than themself. 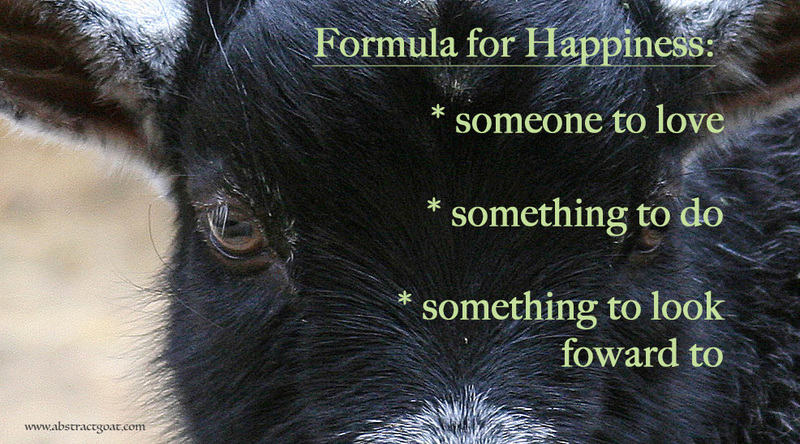 Usually a parent or helper tags along to manage any…mishaps…like runaway goats or children. These classes are divided by age (of the handler) and go up to age 18. Sometimes a show will have an adult showmanship class that we fondly call “The Geriatric Class,” but in general adults don’t like being judged. Kids learn that too; the 15-18 year old class is mighty small. 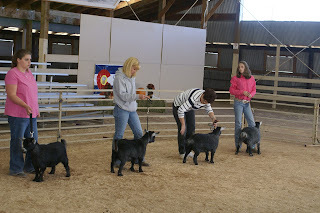 In showmanship, the judge runs the exhibitors and their animals through a mock class and evaluates them on the grooming and cleanliness of their goat, the handler’s knowledge of maneuvers around the goat, the handler’s grace in performing these maneuvers (just knowing how to do the move doesn’t mean you look particularly nice doing it – just sayin’), the handler’s ability to watch and respond to the judge every last second, and, finally, the interview. 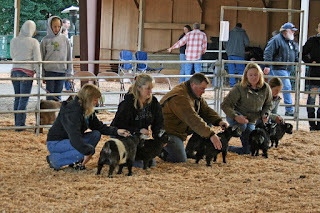 The judge pulls each exhibitor aside, one at a time, and asks him/her (usually her) a series of questions to test his/her knowledge of the pygmy goat and its general care. It’s rather like the Miss America pageant: grooming, talent, interview – no bathing suit. As the kids get older, it becomes quite competitive, and I am proud to say that my Bella may have been one of the top showman competitors in our area for several years running. 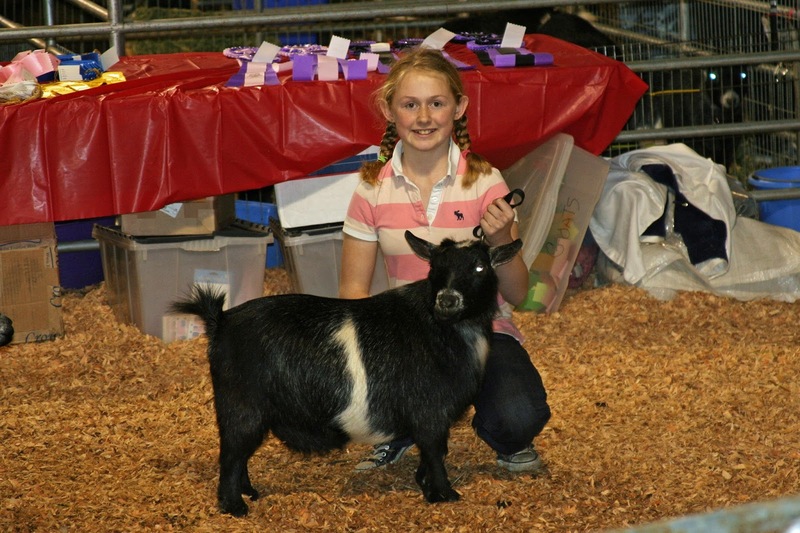 She eventually went to boarding school and retired from the whole goat thing, but when she was on The Circuit, she was “in it to win it.” She practiced obsessively at home, mostly getting her “show face” down to a science. One of the key points of showmanship is that you must look at the judge the entire time (and I mean every last millisecond) with a pleasant expression on your visage. I like to think that the idea behind it is to brighten the day of the judge who otherwise would spend 6-10 hours watching glowers and grimaces. At least for an hour or so, the exhibitors smile. She would hold this expression until her face ached. Those of us who knew her thought it was pretty damned funny, but outsiders believed it (for a while). Judges especially. She was really good at all the other parts, too. She knew the “maneuvers” cold. 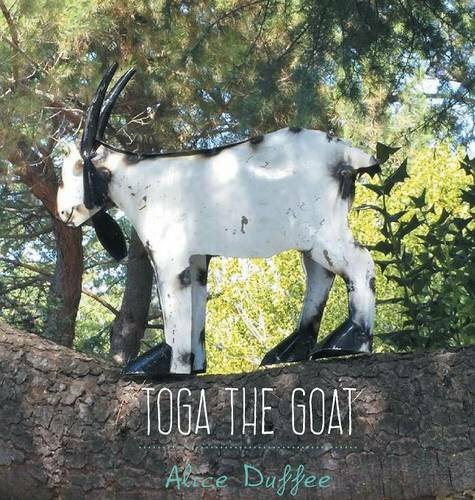 She could spin around her goat with the grace of a Russian ballerina; she could hold perfectly still like a statue for long minutes – all the while “smiling” at the judge, who might at any moment possibly glance her direction to check that she was still watching. 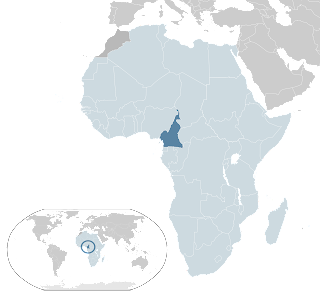 She studied the “Pygmy Handbook” and learned all the parts of a goat, which she could recite both alphabetically and locationally (start at the head and work back). Her trusty sidekick all those years was Pupa, pictured here with Bella and also the goat in the wagon in the previous post. Pupa was a special goat. She may have even been a reincarnated saint. 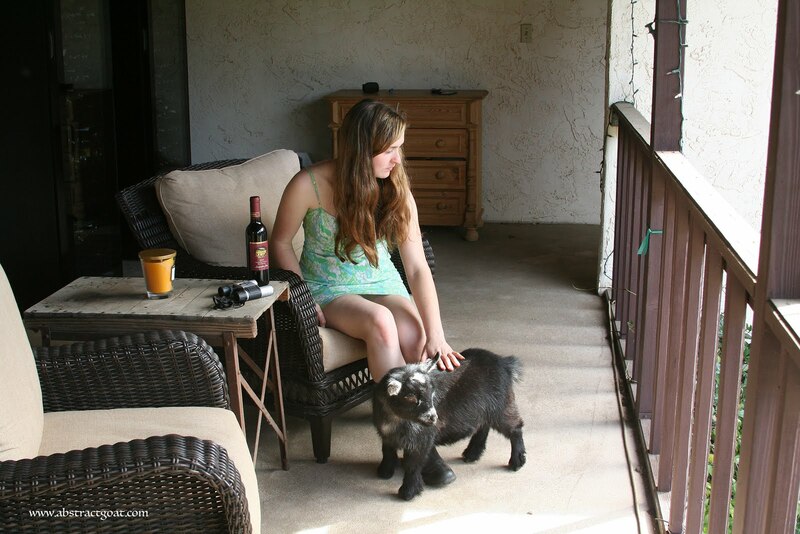 She was 4 years old when Bubba gave her to Bella as Bella’s first goat. Her show name, of course, was not Pupa, but that’s what Bella dubbed her, so that’s what we all called her. Pupa had the patience of Jove and adored Bella beyond all comprehension. For example, Bella could yell across the property, “PUPA” and Pupa would Maaah back in response – every time. But Pupa would only Maaah to Bella. The poor animal went into a bit of a funk when Bella went away to school. And Pupa knew her job; she would follow along obediently and do the “show thing” herself so Bella could focus on Bella. The magic combination worked like a charm and Bella usually won every showmanship class she entered. Lets not forget that this is supposed to be fun (!!). At State and County fairs, the youngsters don their 4-H uniforms, including WHITE jeans and white shirts. Who the hell ever thought that white clothes were a good idea for showing livestock? Obviously someone who has never shown livestock, or done laundry for seven children. The children groom their animals to a high luster and paste on their pleasant expressions. Moms, meanwhile, fuss over their child’s hair and the dirt spots on their jeans and hunt down those pesky green caps. I’ve pulled a few of my fav photos to share. 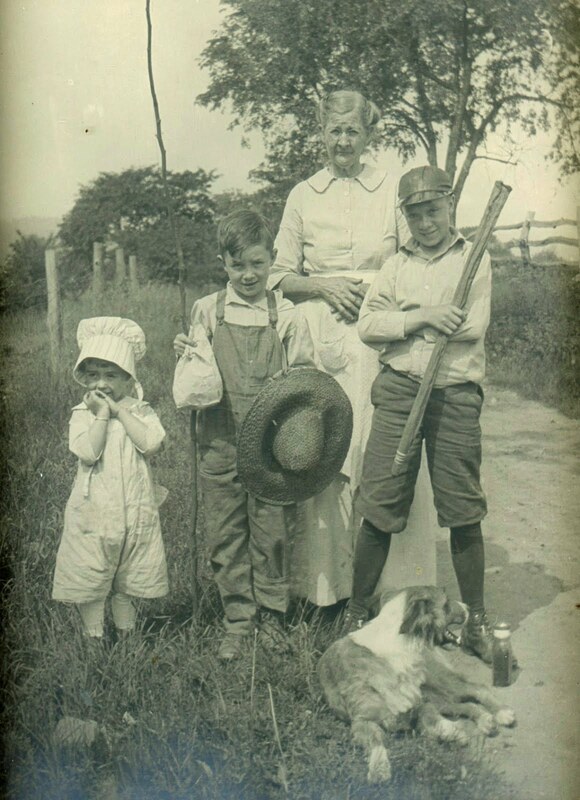 Love the one of Elizabeth fixing her cap with her goat, “Lottie,” firmly grasped between her knees. It’s all about the priorities. The unidentified little girl behind Elizabeth is picking her nose. And there’s Katherine after winning her showmanship class using Bella’s goat. That smirk is absolutely genuine and aimed directly at her sister. Finally, little Bobbie down there is stoic as ever, working on his posture. The tie is bigger than he is. It’s wholesome and adorable. Good family fun, though sometimes a little cut throat – with the moms, that is. Stage moms are stage moms wherever you go. Charlie used to play on a “select” soccer team and I am here to say that the only difference between those soccer moms on the sidelines and the goat moms in the bleachers is the vocabulary and noise level. 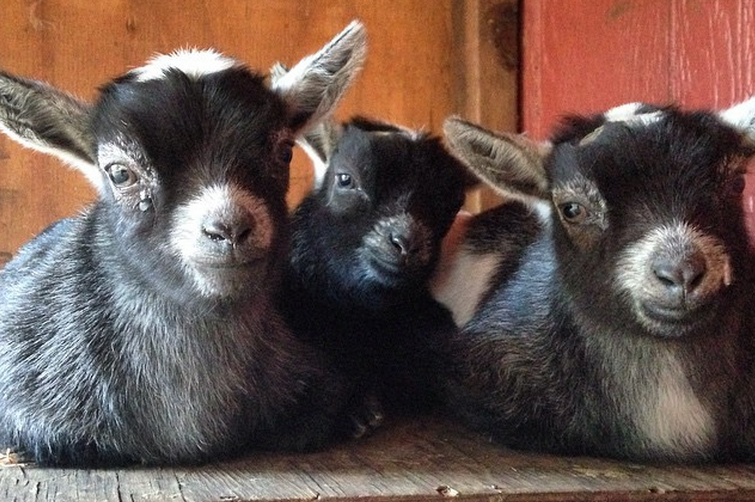 In goat shows, moms don’t yell across the ring at their kids – we just use gestures, hand signals, and theatrics. Like charades. My favorite part is the interview. I mean really, how many times is your kid called up for an oral interview with a stranger? They have to think on their feet, be articulate, be pleasant, and be poised – all while talking about the anatomy and medical needs of a goat. Good practice for life. My favorite judge of all time makes the kids get on the microphone and judge the other goats in their showmanship class – an impromptu judge’s test. As a child, I could no more have spoken spontaneously on a microphone than I could have flown to Mars. I wish someone had pushed me that way so public speaking as an adult would be that much easier. I hope the kids are paying attention! 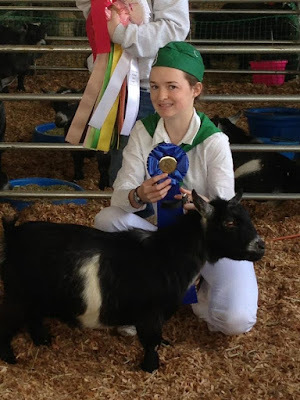 Before I talk about the mechanics of HOW to show a goat, I should go into how to PREP a goat for a show. It’s quite an involved process involving a lot of equipment and hair products. First, you have to catch your goat. I recommend not letting them see you carrying the lead rope or leash. They are smart, these little caprines. Katherine has trained her herd to be docile and easy to catch (especially with the promise of food), but in years past we have run like lunatics around the field screeching after the lightening quick animals. But, I digress, lets assume that the goat is caught. You put your goat in a stanchion, pictured below, which is basically a bench with two upright posts that can be clamped shut over a goat’s neck, thus trapping the front end of the animal. The back end, mind you, is still free. 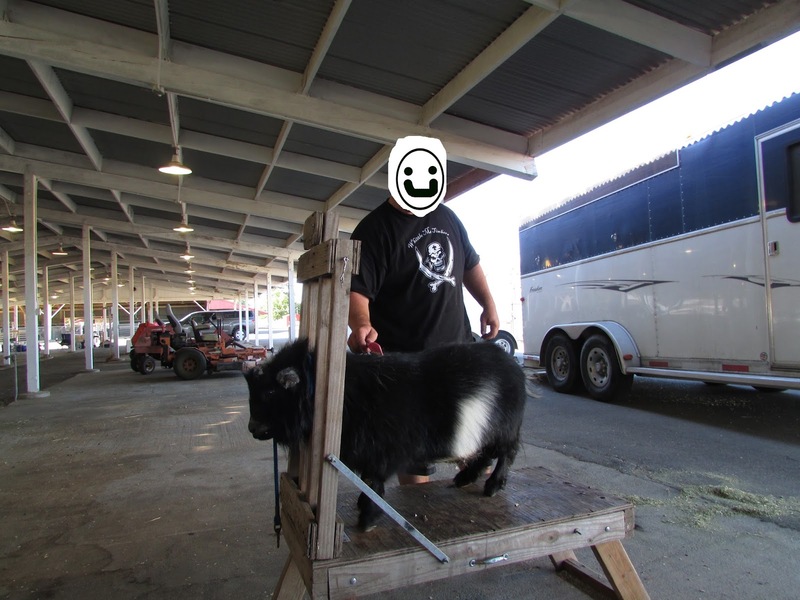 Once secured in the contraption, the exhibitor has access to all parts of the goat. We use garden shears to trim the hooves; it’s more like cutting toenails than shoeing a horse. Next, electric clippers trim the hair in the ears, on the top of the head, around the tail, and along the legs. 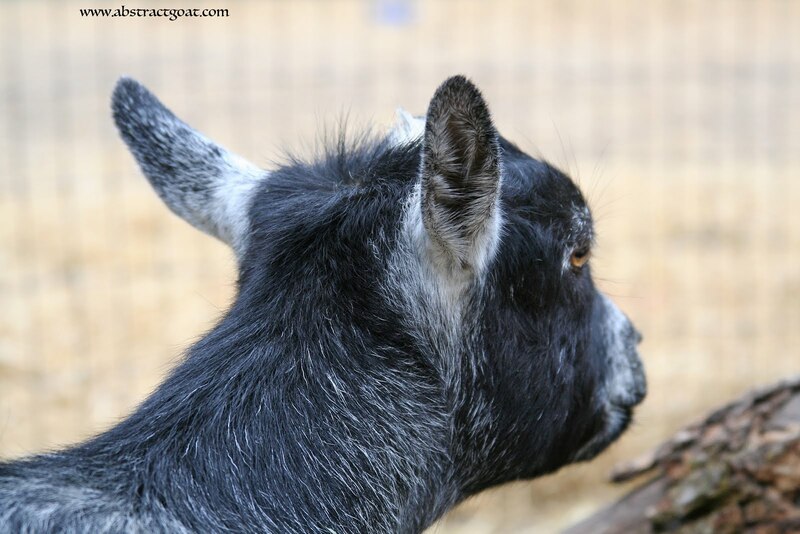 The Seasoned Goat Shower uses a variety of soft and stiff brushes and combs to tease out the fluffy undercoat and smooth down the unruly hairs. 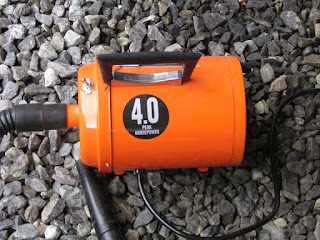 He/she also uses a super high-powered blower to BLAST away any loose hair and dirt. It’s rather like a leaf blower. I find that part of the grooming process particularly satisfying – instant gratification. 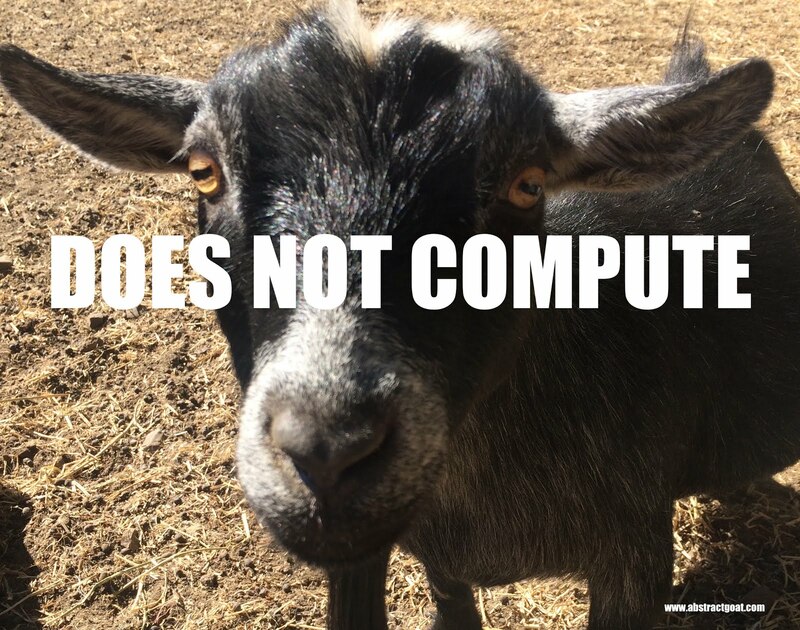 The goats disagree. 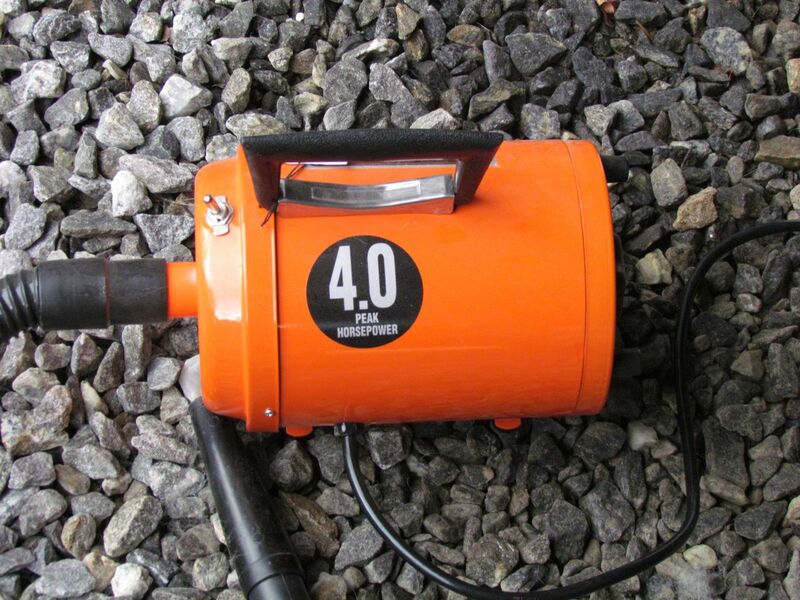 Our blower is a “Metro Air Force Commander Dryer.” 4-horsepower of blowing fury. Watch the fur fly! Then, more brushing and combing and trimming. Finally, the hair products come out. Katherine has upped her game recently with a new range of “show sheens,” dry shampoos, and conditioners. Truthfully, she chooses products by which one smells best. Aromatherapy is always soothing, even in the goat ring. Sometimes we bathe the goats and use whiteners on their white spots—maybe we should do that more often? Hmm. The goats and I all prefer the dry shampoo. 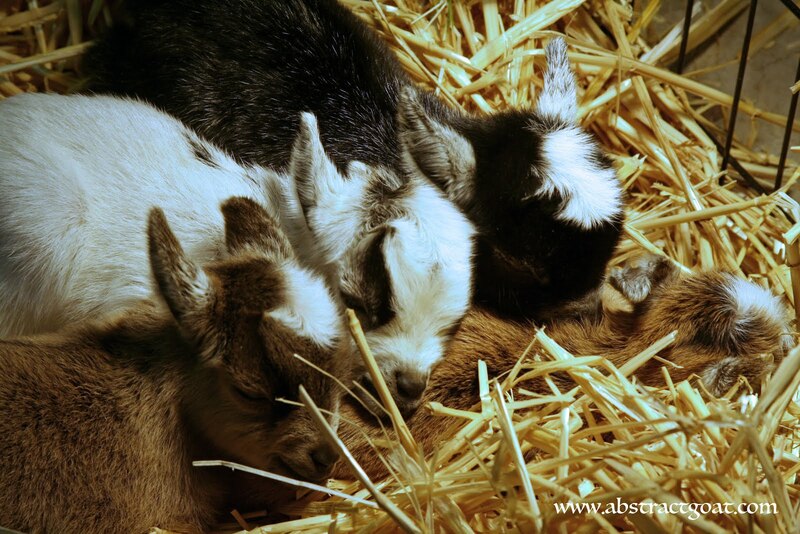 When all is said and done, the goats are fluffy and soft as newborn chicks and shiny as a new penny. At least, they are if you have done a GOOD job. I know people, who shall remain unnamed, who barely dust the hay off their goats before going into the show ring. Tsk tsk. I’ve seen people fluff up their bucks, comb them, re-fluff and then spritz. 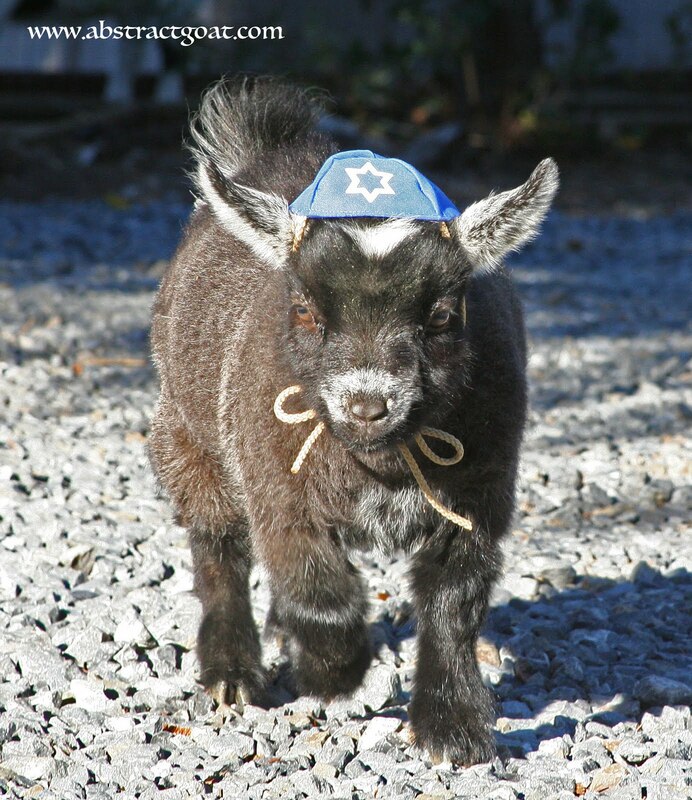 Come on people, it’s a goat. Maybe sometime I’ll tell you about the rabbit show I went to once – now those people are crazy! After the grooming, it’s all rather anti-climactic. 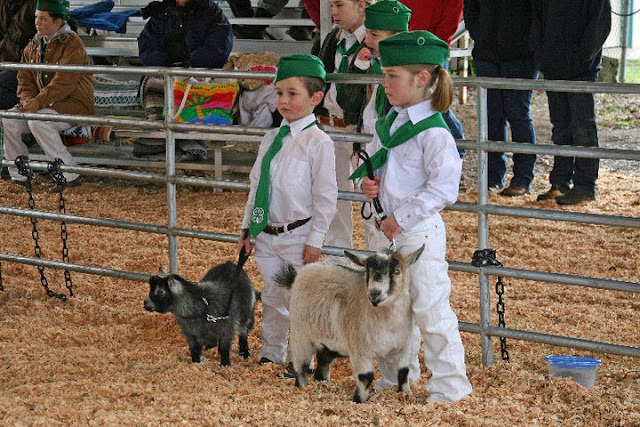 The exhibitor walks his/her goat into the ring at the designated time. The judge checks the goat’s teats or testicles, depending on the class of course, and the exhibitor and goat march off to stand in line with the other goats (and people). 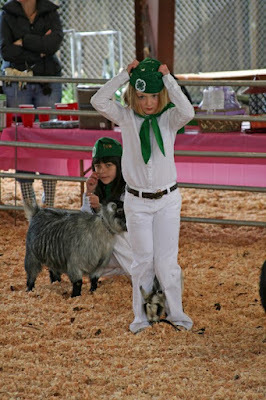 The exhibitors reposition their goats, “set them up” (I love that phrase – sounds devious – sets them up for what? Failure? Success? ), and stand with arm outstretched over the goat to make it look its very grandest. 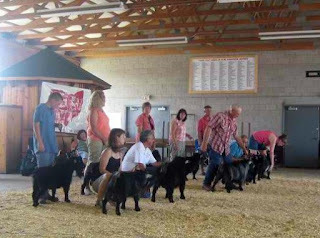 Upon the judge’s command, the line takes off in a slow procession around the ring, whereupon the judge watches how the goat tracks (= walks) front and rear. There’s a right way and a wrong way to walk your goat, but I’m not getting into that today. Suffice it to say, there is technique. The judge moves the goats around some more, and then ranks them from 1st to 5th. The exhibitors reorder themselves accordingly. The judge finally gets on the microphone and explains why goat 1 is better than goat 2 who is better than goat 3 and so on. Phew. Ribbons are distributed. The End. The exhibitors go get their next goat and do it again. A typical show has about 30 classes, in addition to the four showmanship classes in the beginning. Adding on the champion lineup and the grand champion lineup for bucks and does, the grand total is 38 classes (including showmanship). Shows usually start at 9:00 am and can take ten hours, including an hour for lunch (thank the baby Jesus). 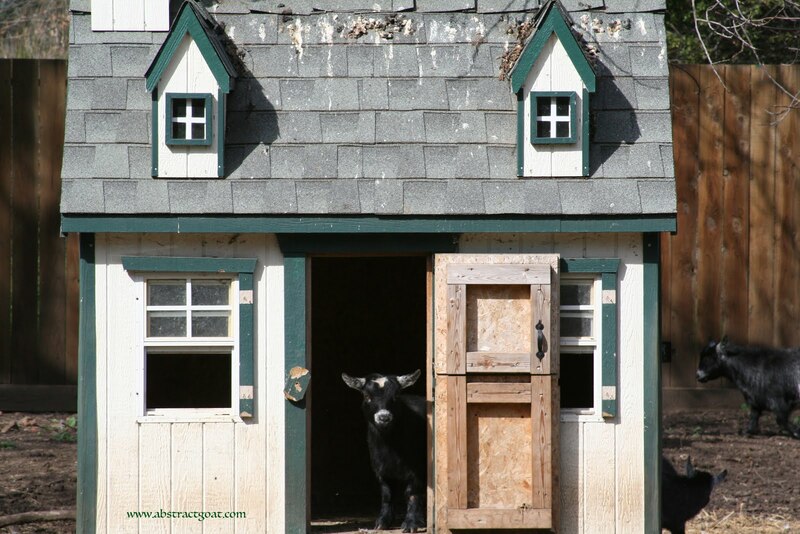 On Saturday, after the first class finishes, a new judge (who has been hiding in his/her rental car so he/she doesn’t see any goats that might bias his/her opinion) appears and starts the second show right away. The second round on Saturday just gets through bucks, which is usually a small group of animals. That means the Sunday show only goes about 6 hours. Hooray! Honestly, I’ve been to shows that have gone until midnight and beyond. It’s not because there were hundreds and hundreds of goats (the average show size in our area is about 200 animals), it’s because some judges are excruciatingly slooow. One of these days I’ll talk more about judges: the who, why, and how. I’ve pulled a couple random pictures off the Internet from shows in Ohio and Colorado to show you what, in general, a goat show looks like. 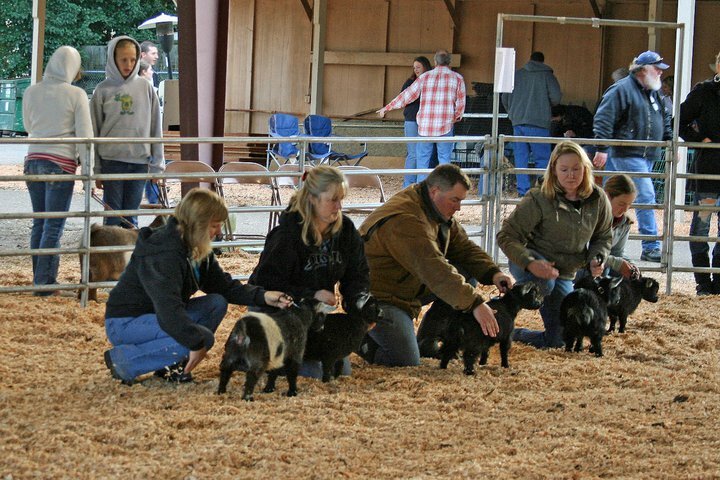 I don’t know any of these people, but they look just like many people that I do know from our regional club, the Sierra Pacific Pygmy Goat Association (www.sppga.com). The consistency of goat shows still surprises me – a goat show is pretty much same every single time. The only difference is the human politics and drama. I think that’s why people keep going back. So, why do people do this? I intend to do some research into that question, as well as “how did you find out about this hobby?” But I am going to venture a guess: it’s the community. Love them or hate them, you get to know one crazy group of people very, very intimately. This photo hangs over my desk. My dad found it at an “antique” store (I use the term loosely) years ago and I still can’t make out the caption on the back. My best guess is that it is from the early twentieth century. It sums up how I feel about my life. Just photoshop in a few more children. We live on a “ranchette” in northern California. The oldest, “Charlie,” is away at college and the second, “Bella,” is away at boarding school in New England. And, no, she’s not in reform school or rehab. I always have to add that part when I talk about boarding school here in California. I’m from the East Coast where going to boarding school is commonly considered a positive way for both teenagers and their parents to experience high school. My oldest son went to boarding school, too, but not my third child, Katherine. Katherine is finishing up her freshman year of high school at a local school. 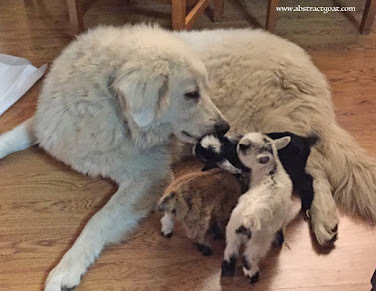 She’s the true goat farmer of the family. I just write checks, drive the trailer, and run interference for her at school when necessary. I also restrain the goats when she performs a myriad of medical procedures on them, and I feed them when she isn’t home. 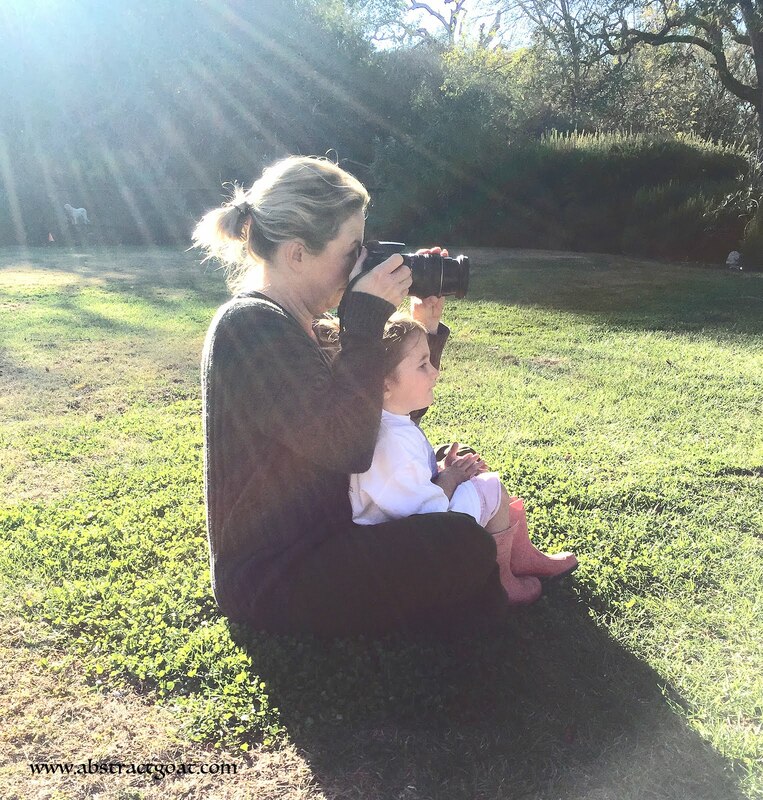 Of all my children, she figures most prominently in this blog because she actually does most of the work. Back to the kids…Elizabeth is 11 and Robbie is 9. Cash is 3 and Tallulah is 2. I had the first five with my now EX-husband. The last two were with my… what to call him…. he’s my ex-whatever. We broke up a while ago and I still don’t know what to call him. When we were together we fumbled through a variety of titles: “partner”(sounds like a business deal or a homosexual – I have nothing against the LGBT community, btw), “boyfriend/girlfriend” (sounds like middle school), “friend” (sounds like you are in denial), “boy toy” (one of my favorites since he was younger than me), “baby mama” (which is what I turned out to be), “lover” (if I wanted to shock the audience), “companion” (as he referenced me in his will). Usually, we just got around the whole thing by introducing the other by their first name and smiling pleasantly. In this blog I shall call him… Bubba. 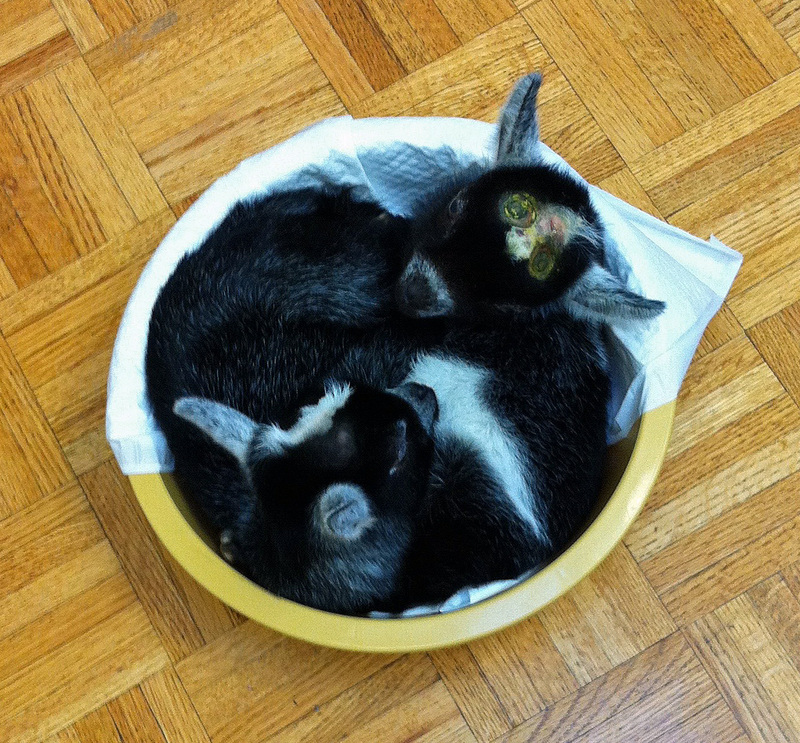 The children and I are in our 6th year of goat husbandry. Before that, we lived in San Francisco with The Ex. We were well-heeled and well-connected. My nanny and I managed the kids like a well-oiled machine, and The Ex worked hard at his….business… (no more hints). The kids did all the yuppy kid activities: ballet, drama, soccer, art, book club, gymnastics, horseback riding, swimming, tennis, lacrosse, and squash. We had one pug, two bunnies, two guinea pigs, a chinchilla, and some goldfish. Bella and I also had a couple horses (off the property, of course). The Ex is allergic to dust and animals, so I had to keep the menagerie down to a dull roar. I confess that I got the rabbits just to spite him as the relationship was on its final descent. Take that, hah! The marriage ended in a blaze of glory (maybe I’ll write about that in a later post – in hind sight it really was funny). A year later, I moved with the kids “to the country.” Well, “wine country” that is. I wanted to get out of San Francisco and away from the thousands of people I had known in my married life, and I was also being more frugal. But really, I was moving in with Bubba. Sacre bleu! The scandal of it all. 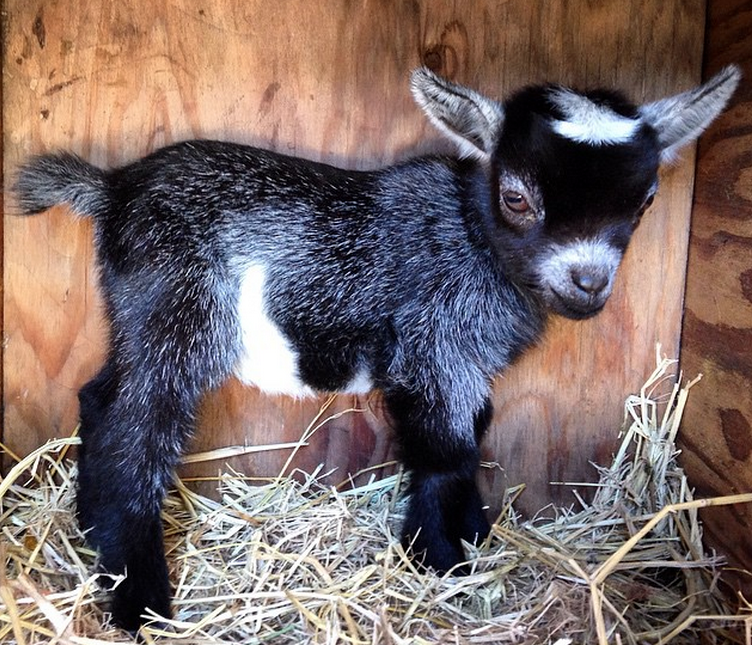 Bubba lived on a goat farm with his mother… yup, with his mother, who I will call Marge. Either one of those statements should have been enough to scare me off, but I was in a “delicate place” emotionally. OK, maybe I was stone cold crazy. 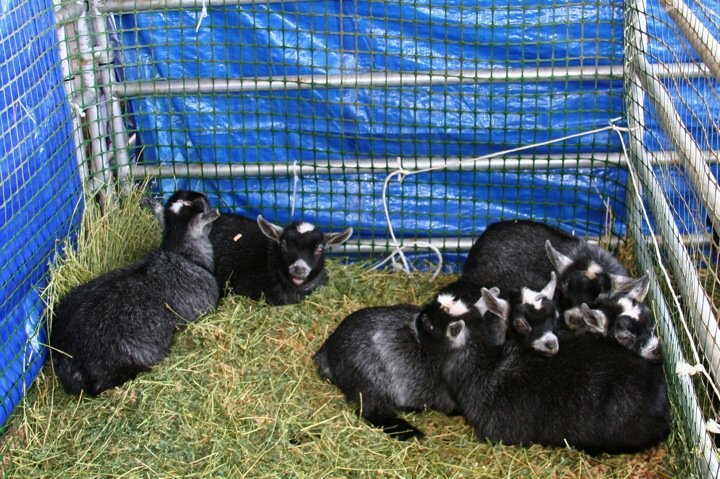 Nonetheless, there we were – me and my five kids living on my new boyfriend’s pygmy goat farm (Marge did move out, though). 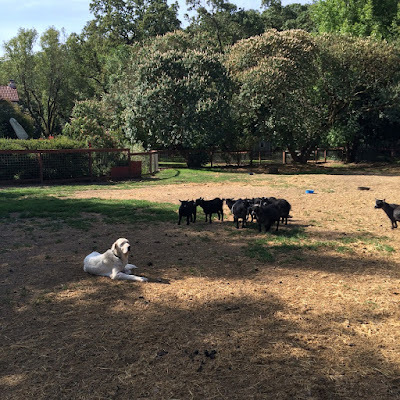 The rabbits, chinchilla, pug, guinea pigs, and fish all fit right in with the 40 pygmy goats, 1 donkey, 1 miniature horse, 3 cats, and 3 other dogs. Bubba has been “in goats” for a very long time. If I told you how long, you would surely triangulate to his real identity, so I will be intentionally vague. He and his mother started the hobby when he was child and joined 4H. 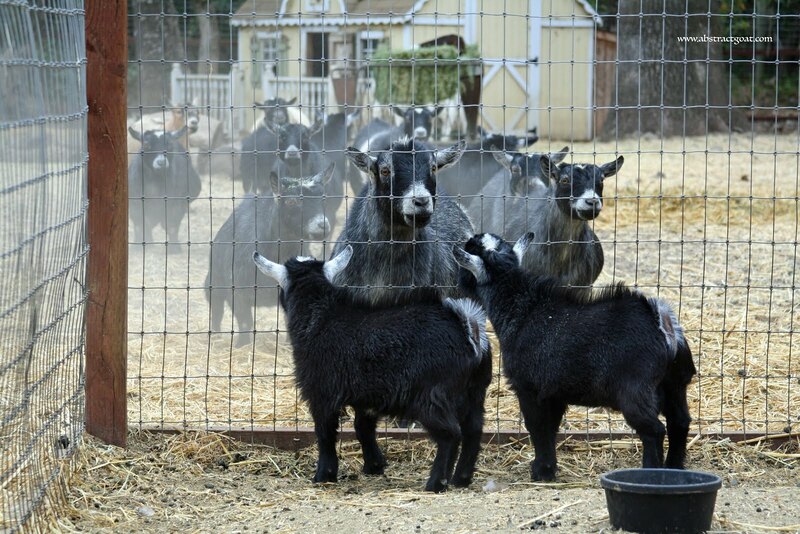 They chose the “pygmy goat project” because: 1) you did not have to sell pygmy goats at the meat auction at the end of every season, 2) pygmy goats are small enough for a single mom to manage (Marge was divorced, too), and 3) pygmy goats are just so cute. Umpteen years later they were still doing it when I arrived on the scene. 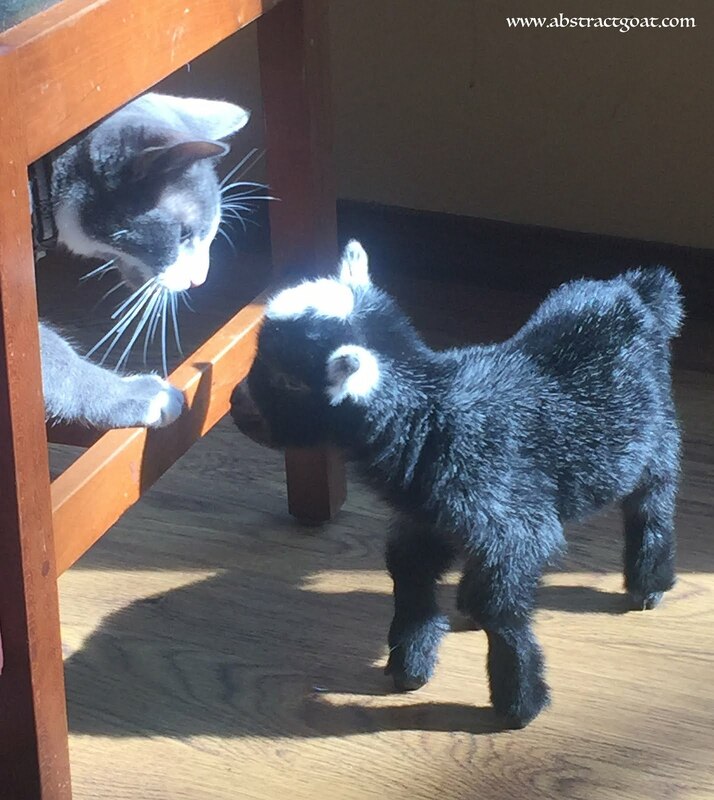 Now that I have left the picture, Bubba and Marge live together again and continue to “do goats.” All I can say is that “goats” must be a very potent addiction. 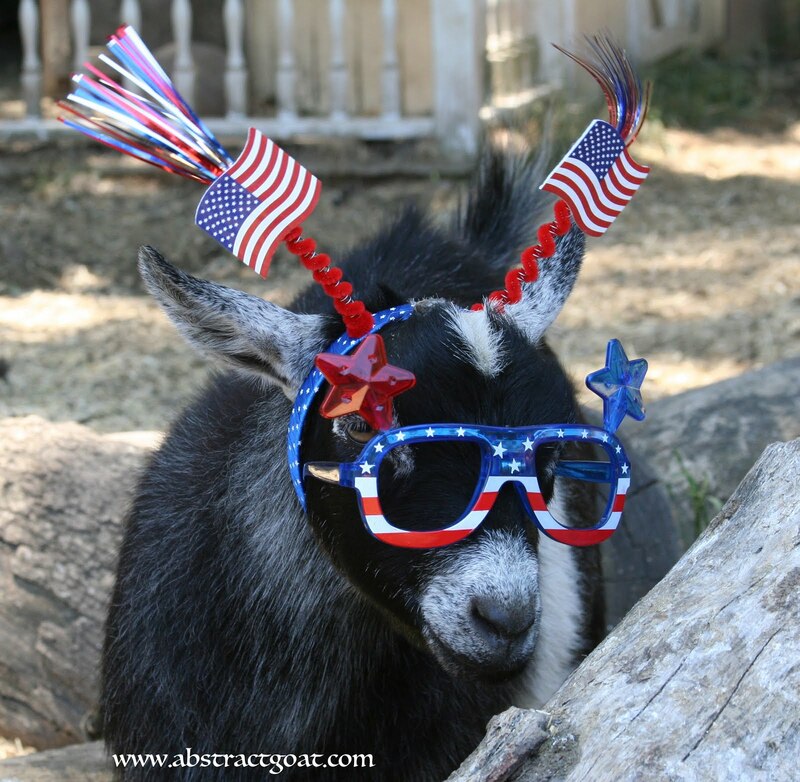 I, too, stayed “in goats”…. for Katherine. 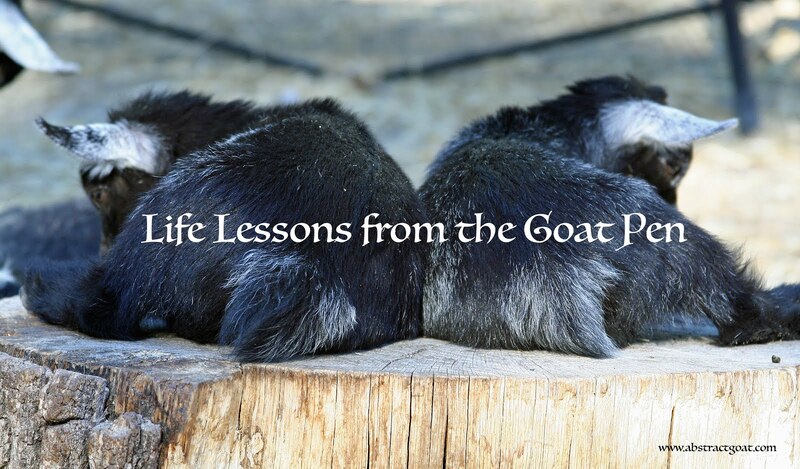 In our 5+ years on the goat farm, Katherine had developed quite a passion for all things “goat,“ and loved the process of breeding and showing the little caprines. Today, we have 30 goats (28 pygmies and 2 boers), 2 mini donkeys, 5 chickens, 1 guinea fowl, 4 cats, 6 dogs and 1 goldfish. And the kids do not take ballet, squash, horseback riding, drama, lacrosse or soccer. Thank god. First, a little about Pygmy Goats. 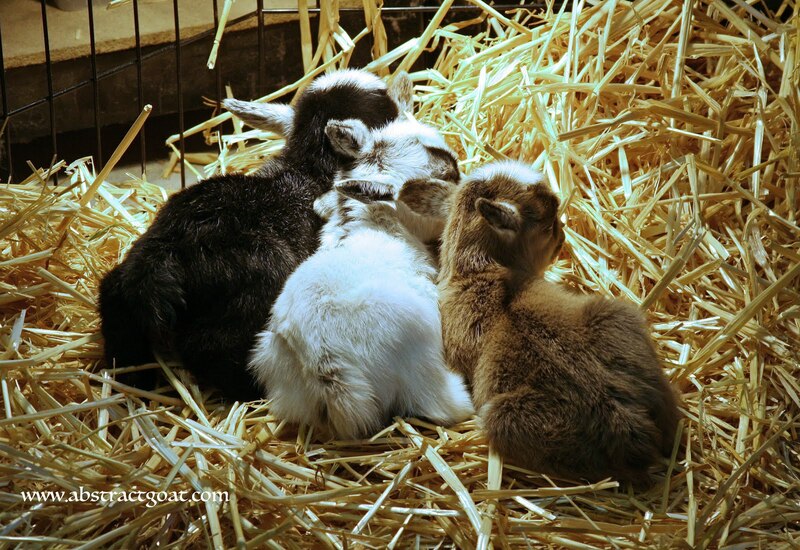 They originated in the Cameroon Valley of West Africa as the “Cameroon Dwarf Goat.” In the 1950s, Swedish and German zoos imported the little cuties as “exotic animals.” My, how times have changed. A family in California (the Rhues) and the Catskill Game Farm in New York imported pygmies to the states in 1959. 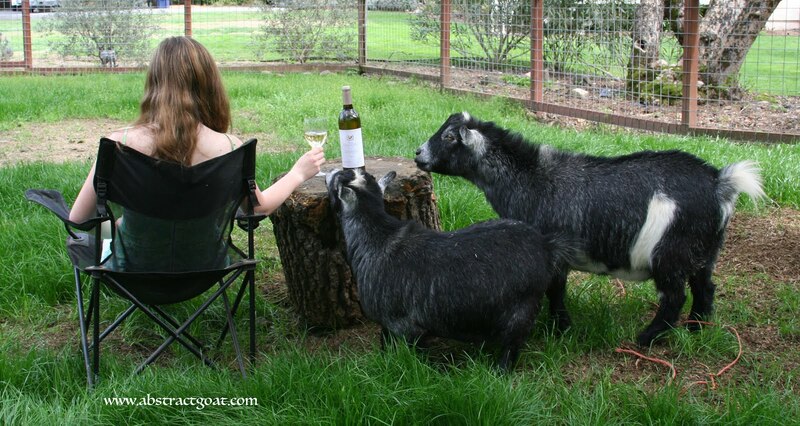 And what do these goats “do,” you may ask. Not much. A Goat Show friend of ours aptly described this breed of goats as the teacup poodle of goats. They have absolutely no purpose other than to look cute. 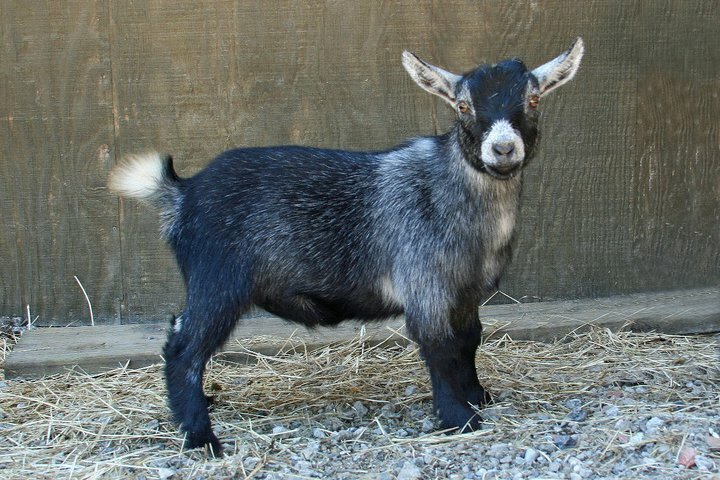 Technically, the Pygmy Goat is a meat goat (versus a dairy goat). However, most people just keep them as pets. Silly Wikipedia said that these goats are milk producers and “working animals.” I would like to see one of these little goats “work.” Maybe pull a cart? Unlikely – way too stubborn. Pack animal? Nuh unh. They aren’t even effective at grazing down fields or vineyards because they are picky eaters. They can, however, “work” at the petting zoo. I have lost count of how many times people ask me, “Do they really eat anything? Like tin cans?” Well, I am here to tell you definitively that the answer is a resounding NO. Ours will pick through a bale of alfalfa hay to eat the delicate leaves and strew the remaining stems (about 50% of the bale) in a messy heap around the feeder. The other question I get a lot is, “ Do you make cheese? Or use the milk?” Nope. First of all, if you have ever spent much any time with a male goat (called a buck) you will immediately notice that goat cheese smells remarkably like goat urine. We eat brie, gouda and cheddar here. No goat cheese. 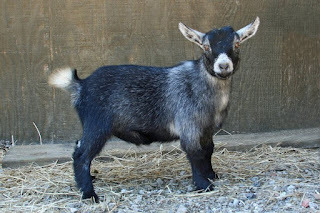 Second, these little dwarf goats stand 16-23” to the withers (top of the shoulder blade), which means that the teat to the ground distance is about 6.” Very inconvenient. 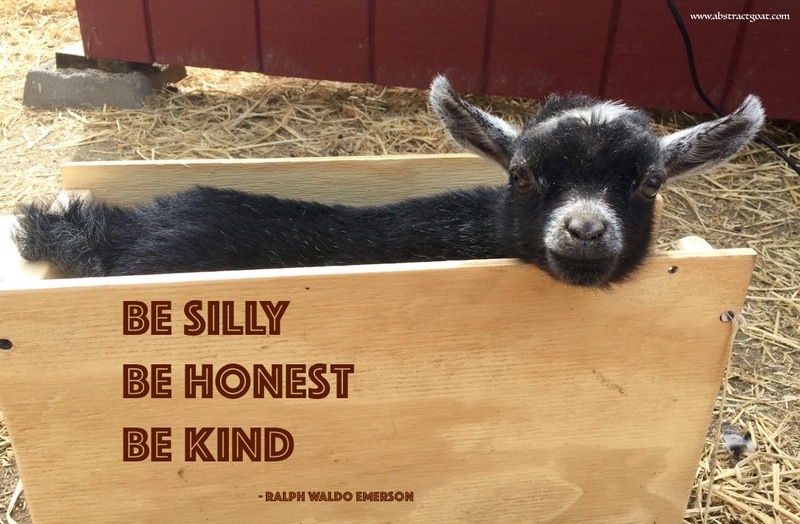 Think instead of those tall leggy dairy goats. 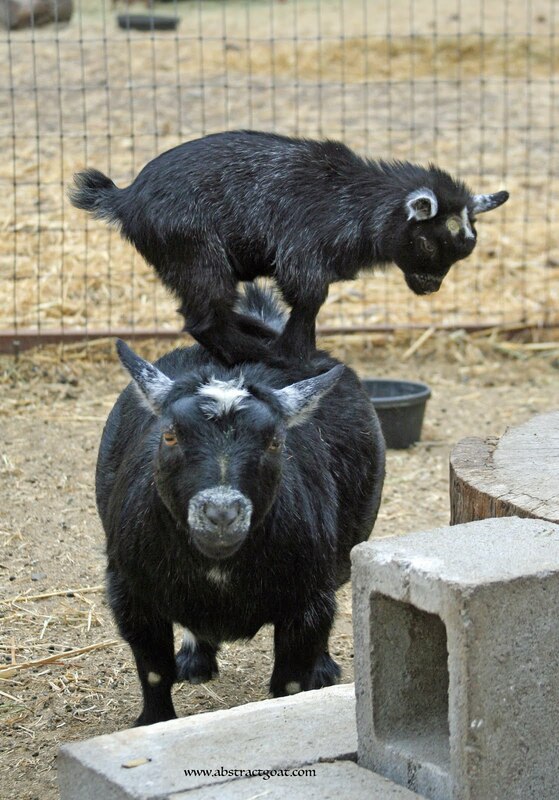 There is a very practical reason to breed dairy goats to be so tall: infinitely easier to milk. 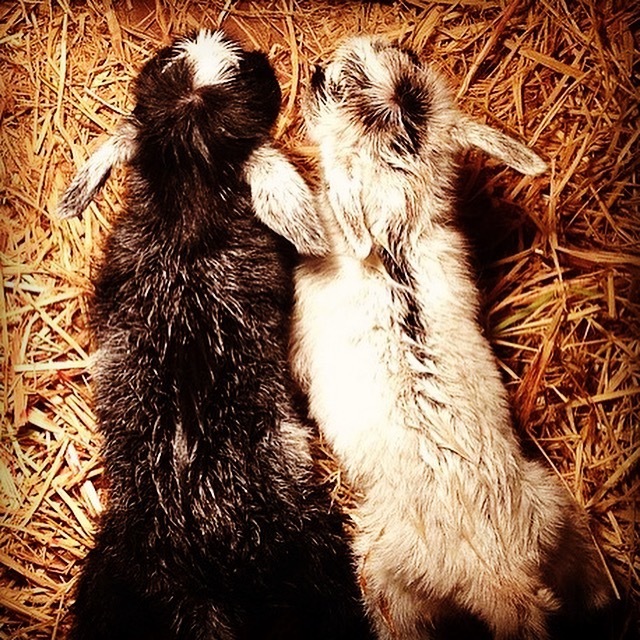 We milk pygmies from time to time IF we have a bottle baby or a doe with mastitis, but the process involves virtually lying on the ground to reach the teats. 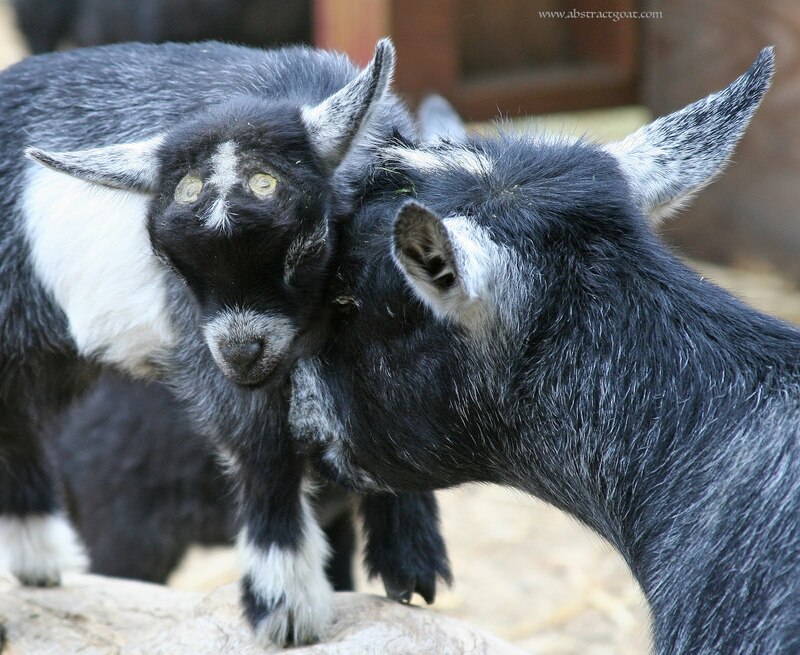 So pygmy goats stand around and eat, poop and sleep all day, with no real purpose in life. Like a teacup poodle. But that’s not totally true, because we show them. Perhaps their true calling, once they migrated from Africa to Swedish and German zoos, was to be spectacular show specimens. Regal and glorious. They are short, chubby animals with animated expressions (sometimes) and kind temperaments (sometimes). They come in four colors: black, gray (agouti), brown, and caramel. In a later post, I will rant about the recent lawsuit about colors, but I just don’t have the energy at this moment. They usually don’t have horns because most owners burn the horns off (“disbud”) for the safety of the other goats around them and the handlers. At least, that’s how I think of it. I’m sure there are other “appearance” reasons. They weigh about 50-80 pounds and fit in XL size dog crates, as a reference. Female = doe; male = buck; neutered male = wether. I think you get the idea. Short, fat, cute, friendly. Just like a teacup poodle.